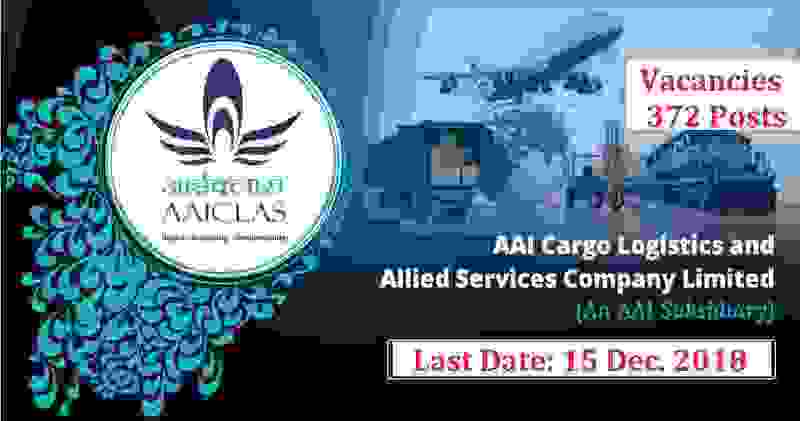 AAI Cargo Logistics & Allied Services Company Limited (AAICLAS) is going to recruit for the vacant positions of security screener posts. AAI invites applications from the qualified applicants for the post of Security Screeners on a Fixed Term Contract for a period of 3 years as per the details given below. More information related to these Government jobs in India is given below in this article. So those who are looking for the Government jobs must read this whole article carefully before applying. Pay Band: Rs.25,000 – Rs.30,000 per Month. Education: Applicants who have completed their Graduation in any discipline (minimum 3 years duration) from a well-recognized University of India. Candidates must have the ability to speak Hindi, English and conversant with local language. Age Bond: All Indian persons whose age is less than 45 years as on 01.12.2018 can apply for these Government Jobs in India 2018. Paying Method: Applicants from India can pay the Examination Fee/application fee through Demand Draft in favor of ‘AAI Cargo Logistics & Allied Services Company Limited’ payable at ‘New Delhi’. 22ND Nov. 2018 is the Opening Date to apply. 15th Dec. 2018 is the Last Date to Submit. Disclaimer: We took this information from a PDF file which is shared on the following website:” http://aaiclas-ecom.org”. All above information is shared on the basis of that PDF file only so all rights of above information goes to this website only.